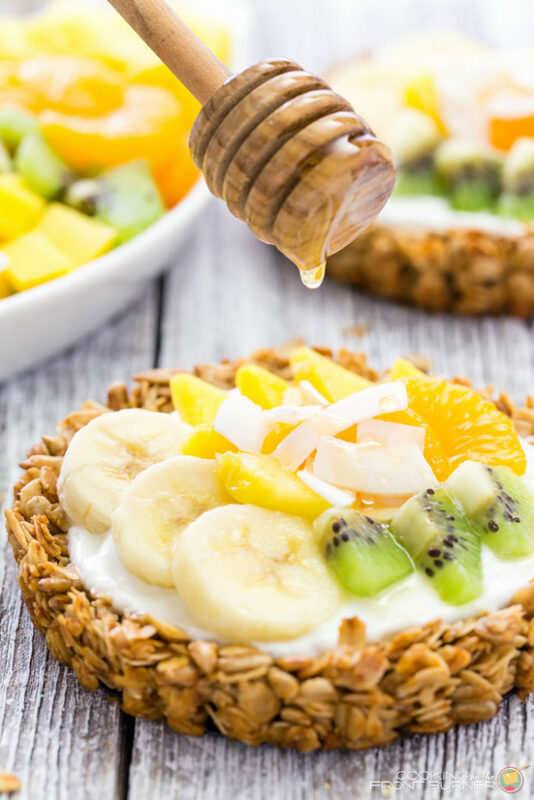 Breakfast granola tarts with creamy vanilla yogurt, topped with tropical fruits and drizzled with golden honey. Something your taste buds will want to wake up to pronto! 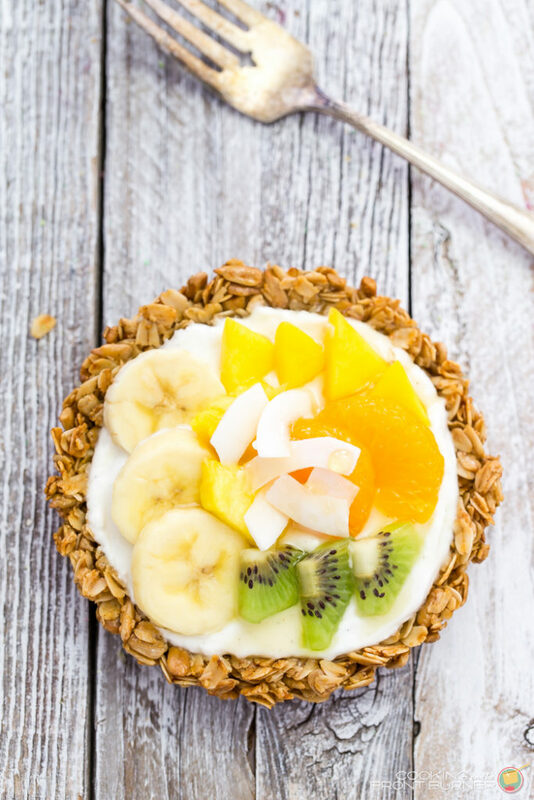 Today we are waking up to these tropical inspired breakfast granola tarts. 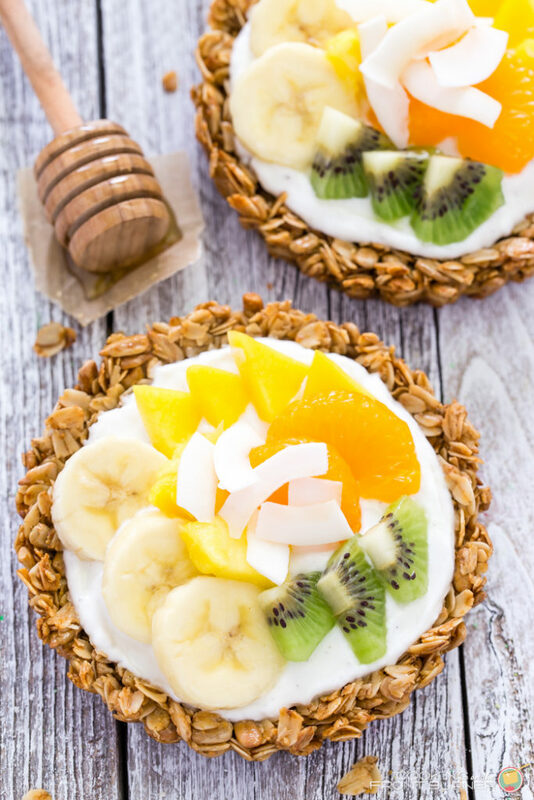 They are a new twist on just having some yogurt in a bowl topped with fruit and granola. 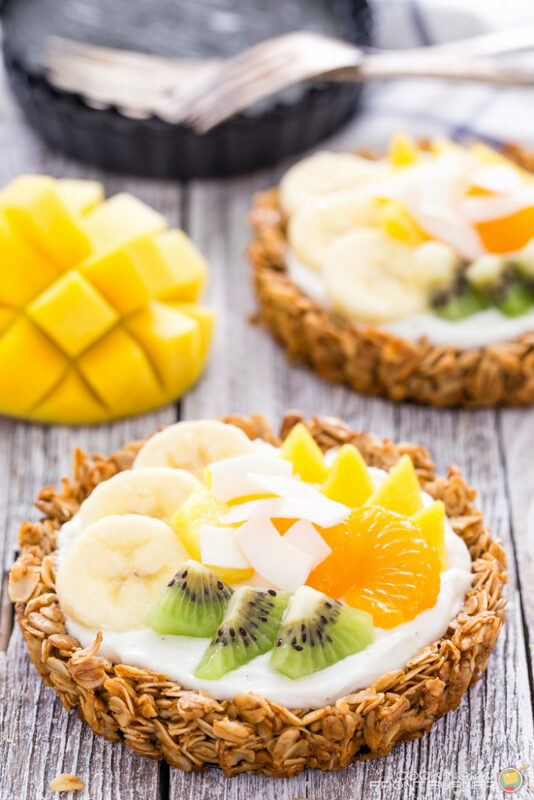 They are fun to make and the granola crust is perfect to hold all that yogurt and fresh fruit. A great way to start your day and get fueled. While I was enjoying these tarts, I had a great thought that you might like. With Easter, Mother’s Day, and other special occasions coming up, why not have a yogurt bar? 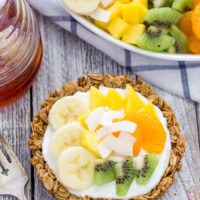 The tart shells can be made up a day or two ahead of time and when it is time to eat, have a variety of yogurt and all different kinds of fruit. 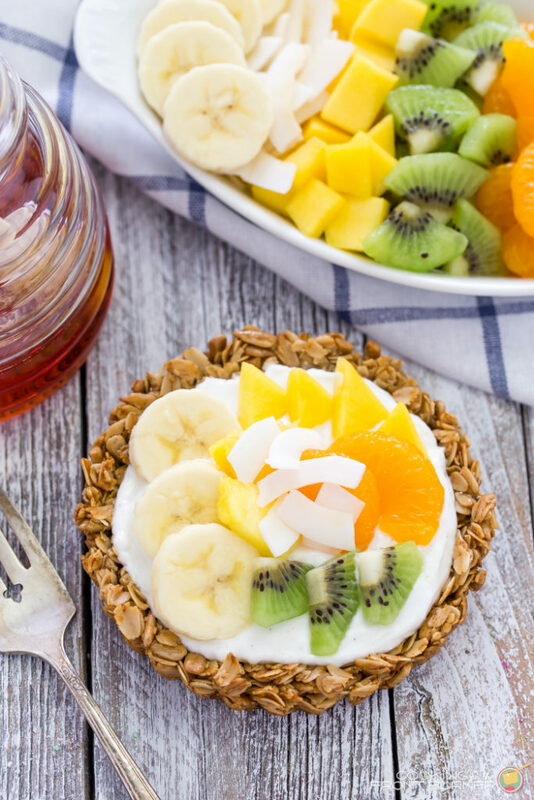 Guests can make their own special breakfast granola tart to enjoy. Since I’m a lemon lover, I think lemon yogurt topped with blueberries and a drizzle of honey would really hit the spot (guess I know my next creation). 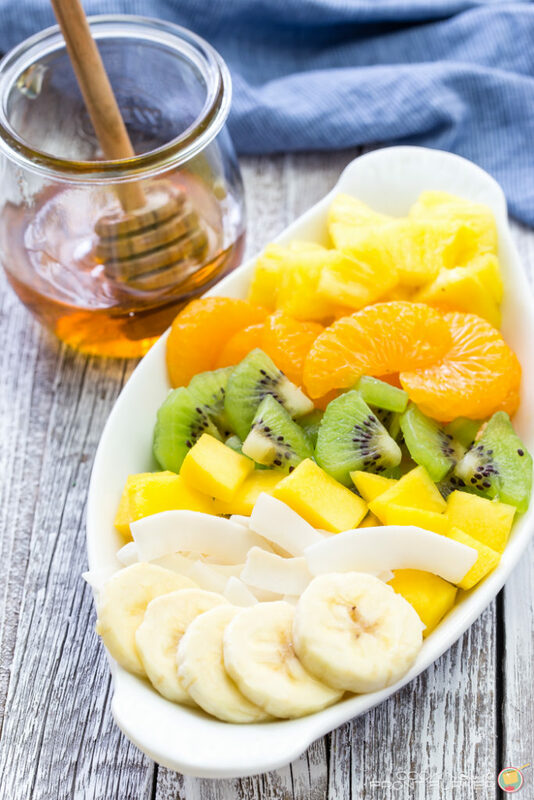 I chose tropical fruits, because let’s face it, if you are really getting sick of winter (like me! ), then these bright fruit tarts are sure to be a great pick me up. I was dreaming I was on a beach with my toes in the sand and leaving the dreary weather behind. Kind of like Calgon take me away. Here’s to putting old man winter to rest and bring on spring! You can use smaller tart pans and maybe get 4-5 breakfast granola tarts out of this recipe. I did not give exact measurements for the fruit since you can put on as much or little as you like. It’s also important to let the tarts cool completely before removing from pans to avoid any mishaps. Also, rub some fresh lemon juice on your bananas to keep them from browning. 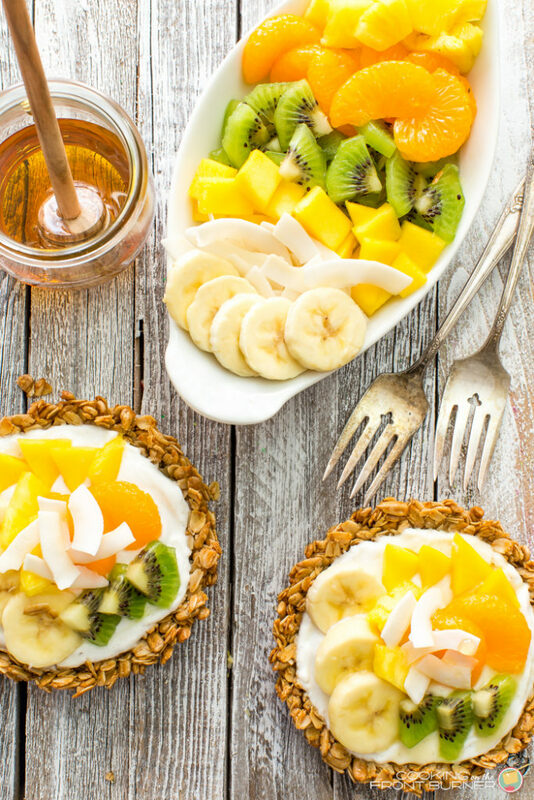 Hope you enjoy this breakfast granola tarts recipe! Don’t forget that honey drizzle! 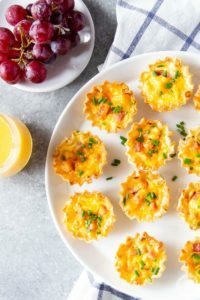 Perfect for breakfast or brunch. 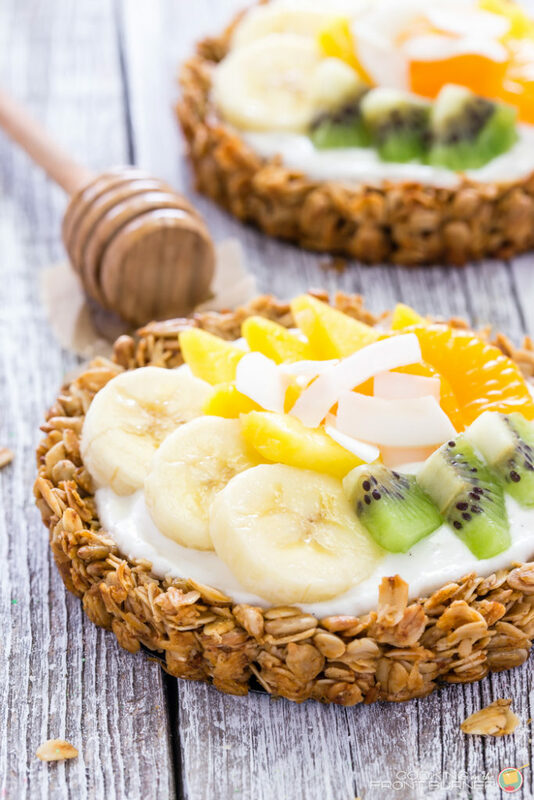 Start your day off right with these granola tarts with creamy vanilla yogurt, topped with tropical fruits and drizzled with golden honey. Something your taste buds will want to wake up to pronto! Divide the mixture between the 3 tart pans and press the mixture evenly on sides of pan and bottom. Be sure to leave a "well" for the yogurt. I used the bottom of a glass to press the bottom down. Remove and use the back of a spoon to press the bottoms and sides again. It is best to make up tarts right before eating so crust doesn't get too soft. These look amazing! Pinning! Thanks for linking it up with Funtastic Friday! 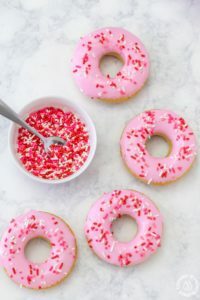 These look over the top delicious! 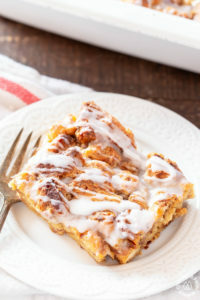 I think a brunch featuring these is definitely in order! What a gorgeous little breakfast bite…it almost makes me want to host a brunch! 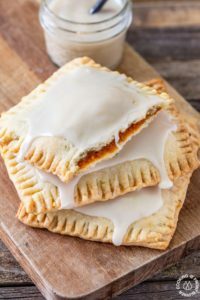 The tarts look so so delicious! Love the recipe! Yummy!! I need to try this! Looks so yummy! Thanks for sharing at the Inspiration Spotlight party. Pinned & sharing.